If you are having problems with your dog chewing up shoes, clothes, or household items it can be very distressing. However, while this behavior is distressing it is natural for a dog. Dogs use their mouths like humans use their hands. Anything a dog wants to handle or pick up goes into their mouth. In addition, puppy’s teeth in the same way that human babies do. In fact, puppies may teeth for the entire first year of life. Therefore you may not be able to teach your puppy or dog to stop chewing completely. Instead, you can teach your dog which items they can chew and which ones are off limits. If your dog likes to chew you should provide them with something safe to chew on. Chew toys come in many different shapes and forms today. You might consider bones, rubber chew balls, or cloth ropes. Some brands infuse the toy with a special scent that will make the item attractive to your pet. However, if your dog shows no interest in the item you might try placing it in the food bag over night to get a familiar smell on the toy. When you see your dog chewing on something that they shouldn’t you have to reprimand them for the behavior. 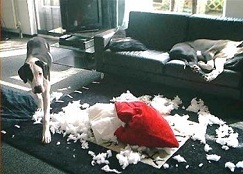 Take away the item that the dog shouldn’t chew on and say commands such as No or Bad. Then replace the item with a chew toy and praise the dog when it accepts the substitute. This will reinforce that chewing on toys is fine but not chewing on your things. However, you should never reprimand the dog if you didn’t catch him or her in the act. While you may think the dog remembers what it did, it doesn’t remember and will think you are being mean. Only correct the behavior when you catch the dog in the act of chewing.